Aid workers are increasingly at risk. Afghanistan and NATO: Is Europe Up to the Fight? The world is sorely in need of humanitarian aid these days, what with a global recession deepening every day and numerous conflicts raging. But as the number of aid workers operating across the globe has soared  more than doubling over the past decade to a record 290,000 people last year  so too have attacks against them, according to a report published Wednesday by the London-based think tank Overseas Development Institute (ODI). Yet the sharp increase in the number of attacks over the past few years has jolted aid officials, some of whom are wondering whether they might soon be driven out of conflict areas altogether. "Vast parts of Sudan, Somalia and Afghanistan are without humanitarian assistance because it has become too dangerous to operate there," says Peter Buth of the emergency team of Médicins Sans Frontières (MSF) in Holland. "It is incredibly frustrating." The surge in attacks, says the ODI report, "highlights the dearth of viable options to keep staff secure in the most volatile contexts, where humanitarian aid is most needed." According to the report, an average of 95 aid workers were killed in each of the past three years, up from an average of about 66 each year between 2003 and 2006. The rate of kidnappings of aid workers has accelerated even more quickly, from about 18 a year between 2003 and 2006, to about 57 a year for the past three years. Operating across hundreds of countries, aid workers are in most danger in places where they represent one of the few Western organizations left in the area  as in Somalia, the villages of Darfur or remote parts of Afghanistan. 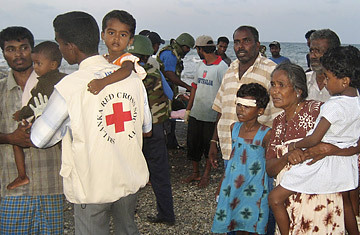 As car-jackings, death threats and assaults continue to mount, organizations such as Oxfam and Médicins Sans Frontières have scrambled to tighten their security operations in dangerous missions, by corralling their staff into guarded complexes ringed with barbed wire, for example, and pooling intelligence with other humanitarian groups. Still, the new tactics offer no guarantees against well-armed foes. "The attacks have much more to do with the aid workers' status, rather than because they have assets or cash on hand," says Adele Harmer, research associate for the Humanitarian Policy Group at ODI and one of the authors of the report. (See a PDF of the report.) The organizations are associated with foreign powers, with what is perceived to be the enemy." So it was in mid-March, when gunmen blasted their way into a Darfur compound of MSF Belgium and kidnapped five aid workers, shortly after prosecutors at the International Criminal Court in The Hague had handed down a war-crimes indictment to Sudan's President Omar al-Bashir  its first for a sitting head of state. Enraged at what he claimed was a Western attack on his presidency, Bashir expelled 13 aid organizations operating in conflict-ravaged Darfur in Western Sudan, perhaps the world's most complex humanitarian disaster at the moment, with millions dead or driven from their homes. MSF Belgium was permitted to stay in the area, but their staff, more isolated after the explusions, found themselves more vulnerable to attack. (The kidnapped aid workers, who included an Italian doctor, a Canadian nurse and a French coordinator, were freed after three days.) "In Darfur, kidnappings were basically unheard of until the indictment of Bashir," says MSF's Buth, who previously worked in Sudan. "These incidents are all very specific to the context." Faced with dwindling options for keeping safe, Western aid workers often retreat to the capital cities of conflict-ridden countries or to their headquarters abroad, leaving behind local staff to run essential services like distributing food or running health posts. "Organizations perceive that their local staff are going to be more secure because they live in the region," says Harmer. Yet they are just as likely to be attacked, according to the ODI report. Somalis working for U.N. aid agencies faced the highest rate of attacks of any aid workers in the world last year  about 46.7 attacks for every 1,000 workers. That's because they are often drivers and guards, and come into much closer contact with armed groups. "They do the jobs at the coal face," says Harmer. And if the attacks continue to drive Westerners out of conflict zones, they are likely to do many other  equally dangerous  jobs too.